Thank you for using TIME HACKER. 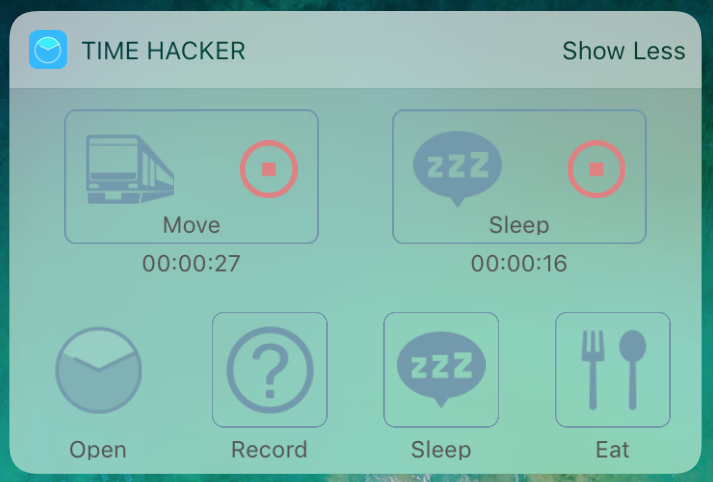 TIME HACKER has developed for the purpose of supporting "making time in busy everyday". Details are also described in here, so please take a moment to read it. 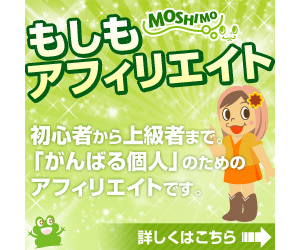 It is the top screen of the application. You can start measuring the action here or stop the action under measurement. 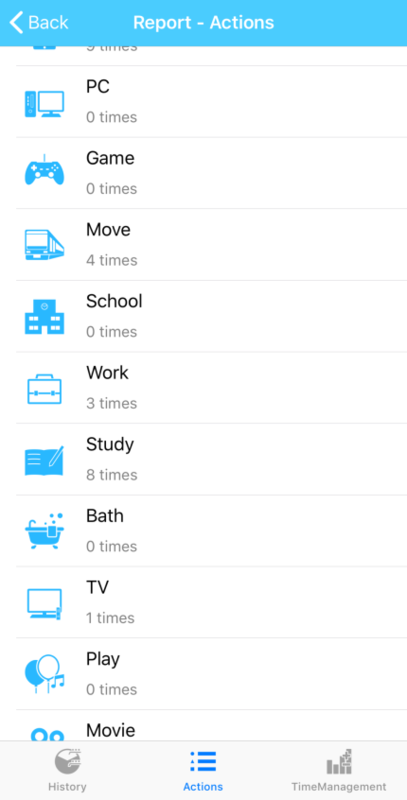 Both measurements start by tapping "frequently used action" and "action list". 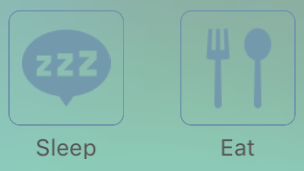 Here are the top 3 most frequently used actions. A list of registered actions is displayed. You can do the sorting order, change the action, etc. in the action list screen. Please refer here for the method of new registration. Tap the action to display this screen. While measuring, it will continue even if you close the application. When performing another action concurrently during measurement (for example, reading while traveling on a train, etc. ), "Temporarily executing button" You can add an action by tapping. You can stop the measurement by tapping this stop button. By stopping the measurement, the original Top screen is displayed. By tapping this button, you can start the measurement without selecting any action. When you are in a hurry, if you can not afford to select an action, please start measuring from this button etc. Please use. Also, if measurement is started from here, the action is set to "not set". By tapping this icon on the top screen, you can open the Report view. By tapping this icon on the top screen, you can open the action list view. By tapping this icon on the top screen you can open the menu screen. You can check the list of registered actions. Although multiple actions are registered from the beginning, if you do not need to delete or hide the action, please change to another action name and use it. Here is what we can do with this view. You can register new actions. By tapping this button, we will transition to the screen of action new registration. Please refer here for the method of new registration. By pressing this button you can rearrange the actions. The sorted actions are reflected not only on the action list but also on the top page. Reordering can be canceled by tapping the sort button again. By tapping the action in the list, you can switch to the action details / edit View. You can check the details of the action and edit it. On the Action New Registration view, enter the following items. Please enter the name of the action. 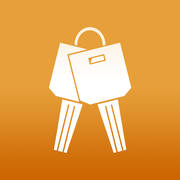 This item is mandatory input. Please select the action icon. 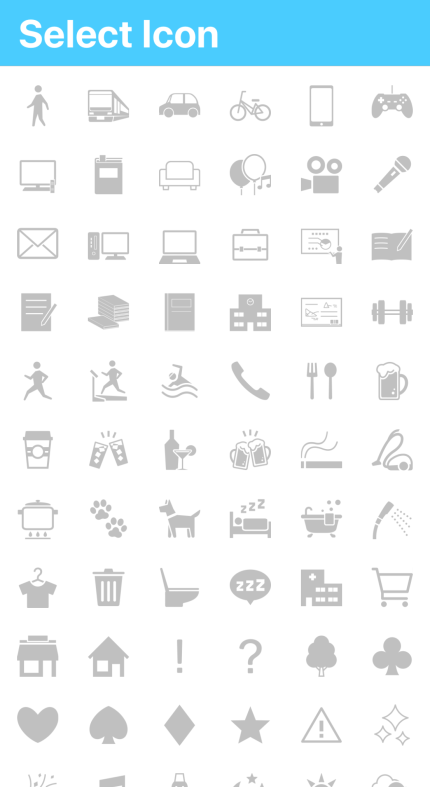 When you tap here, the following screen is displayed, so please select your favorite icon. If the action you want to register is an action you want to cut time for you, turn this switch on. 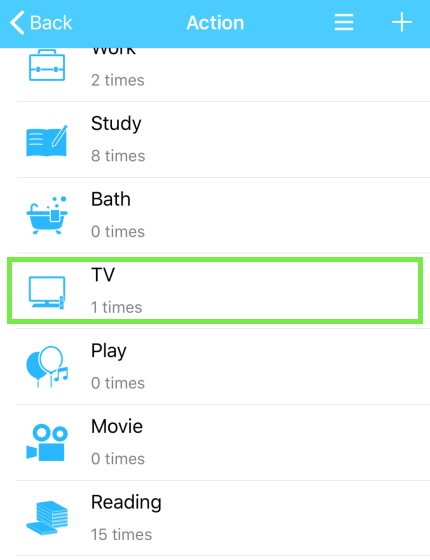 For example, have you thought that you can secure time for study if you cut down on the time of the TV? In such a case, I will make an action on TV and turn ON what I want to cut. 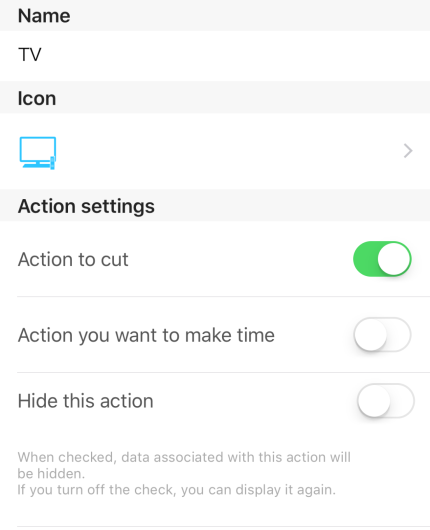 After that, if you watch TV in the day, record by this action, please check on the time management of the report screen on how much you can cut off this action you want to cut later You can do. The following screen is a report when you recorded the action you want to cut for one week. You can not check both actions you want to cut and action you want to increase. If both are selected, will be saved with last registered content. If the action you want to register is an action you want to create time for you, turn this switch on. For example, if you want to increase the amount of study time with the idea of the opposite of the action you want to cut, turn on the action you want to increase your study's action. 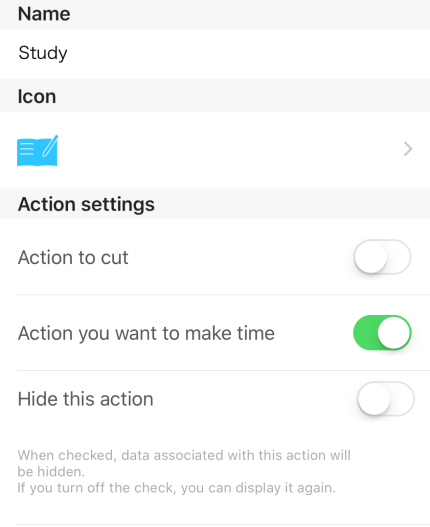 After that, when studying in the day, by recording with this action, you can check how much action you want to increase later by time management on the report screen can. The following screen is a report when you recorded the action you want to increase for one week. If you want to hide this action, turn this switch on. 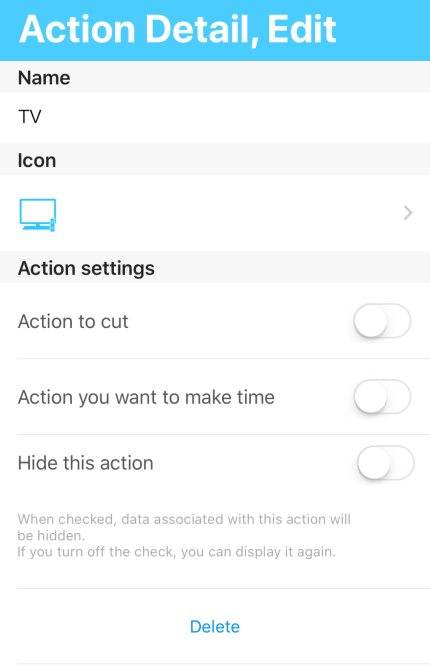 By turning it on, you can not see this action on the top screen action list or report screen, and you can not see the recorded data. If you want to see it again, you can display it by releasing this switch. Since the save button is displayed at the top right of the view, you can save by tapping here. In the edit view, it is automatically saved at the same time as input. You can go back to the original view as it is and there is no problem. To delete the action itself, tap the "Delete" button. By deleting, the following data is deleted. Once deleted, it can not be restored. On the report screen, various analyzes can be performed based on the recorded action. TIME HACKER currently offers the following reporting functions. I will explain each report function here. You can check the action history of the specified period. 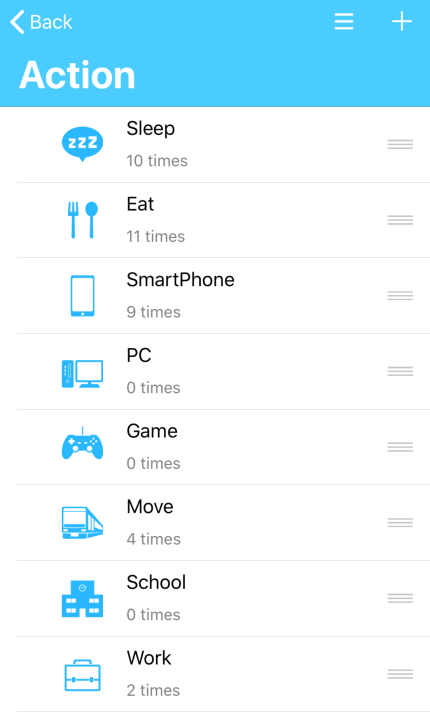 In addition to checking the history, you can edit actions. To edit an action, you can do by tapping the action at the bottom of the screen. Please make various edits and press the save button at the end to save. The end time can not be set before the start time. If an action is in progress, you can not specify the end time. If you want to manually enter the end time, please stop measuring the action. In this screen, you can analyze the history of each action. The following is the first screen that appears when you tap on the action's Action tab. 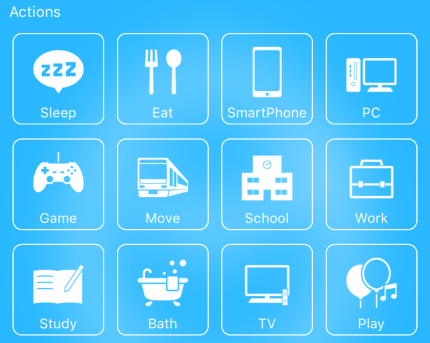 By tapping each action you can analyze each detail. Below is the screen when we saw the game in one week period, for example. In the action setting, if you set action to set to cut or set the action you want to increase Analysis can be done. 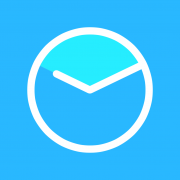 How much wasted time is sent a day? 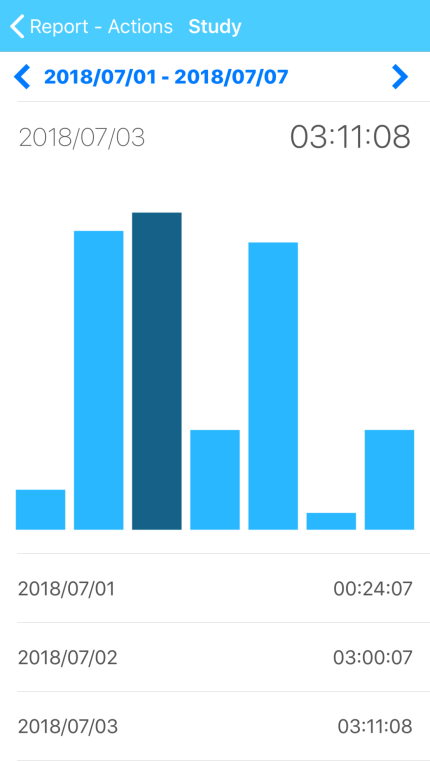 How much time did you want to secure for skill up etc? The following screen is the report screen of the action you want to increase. Switching actions you want to cut / action you want to increase can be switched by tapping below. 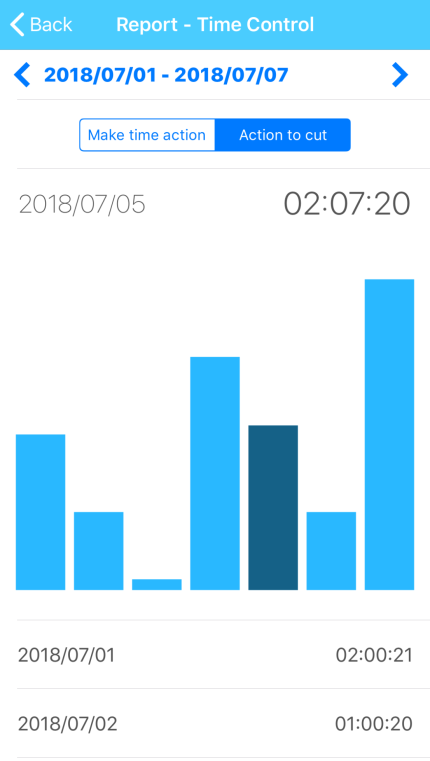 Also, by tapping the place where "Date · Time" is displayed, you can check how much you wanted to shave / increase the day. 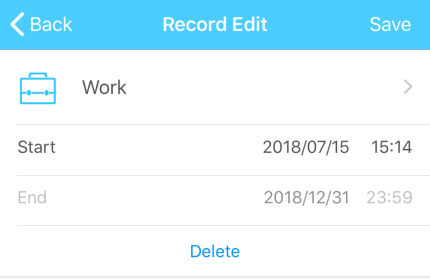 By tapping the date on each report view, you can specify in which time period the report is analyzed. 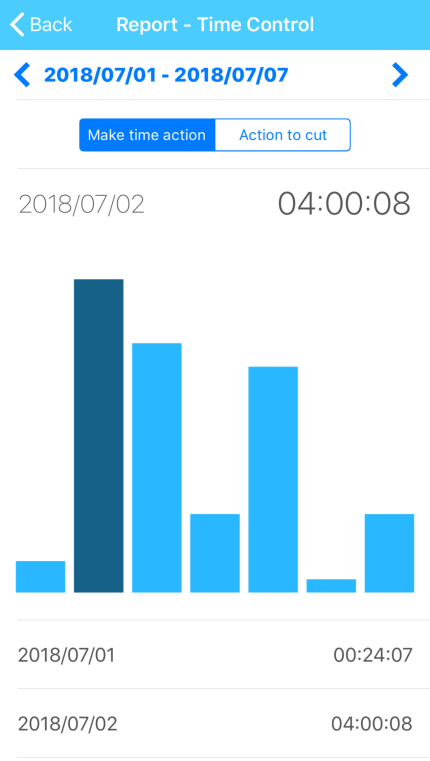 Tap the date to display the view to select the date period. You can also display the next period / previous period by tapping the arrow next to the date. 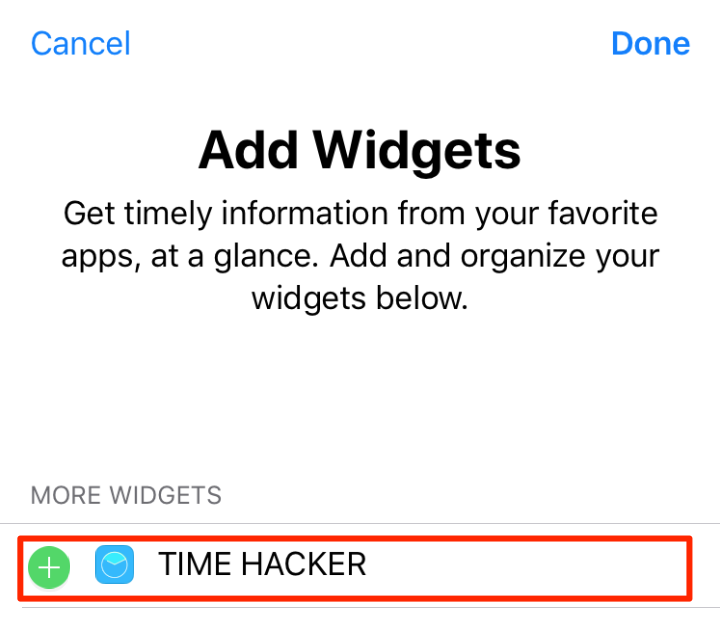 By registering TIME HACKER as a widget, you can execute the following functions within the widget. To set widget, Please tap "Edit" on the widget screen. 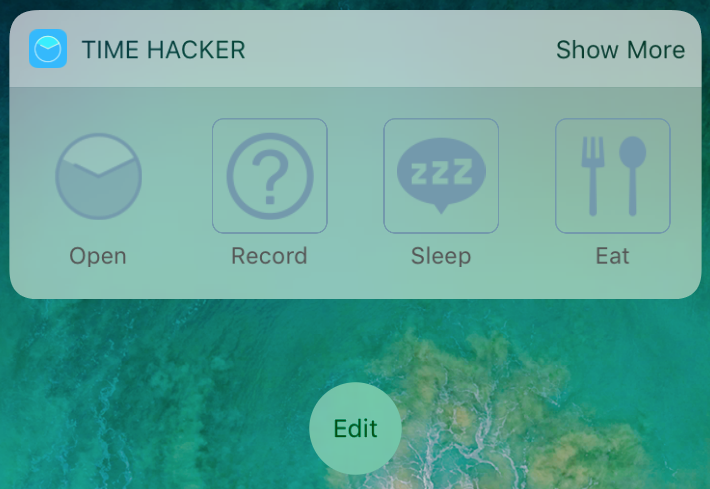 Since "Add Widgets" is displayed, Please add TIME HACKER. Tap "Show More" in the upper right The display will be in 2 rows. 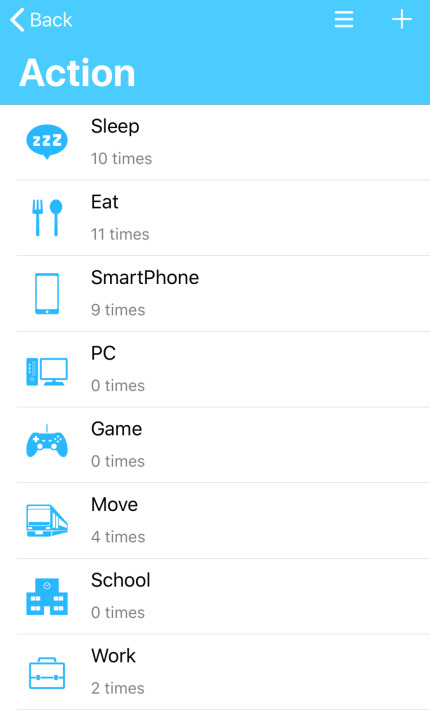 Tap "Show Less" to display one column. Tap to open the TIME HACKER application. Recording will start with no settings. 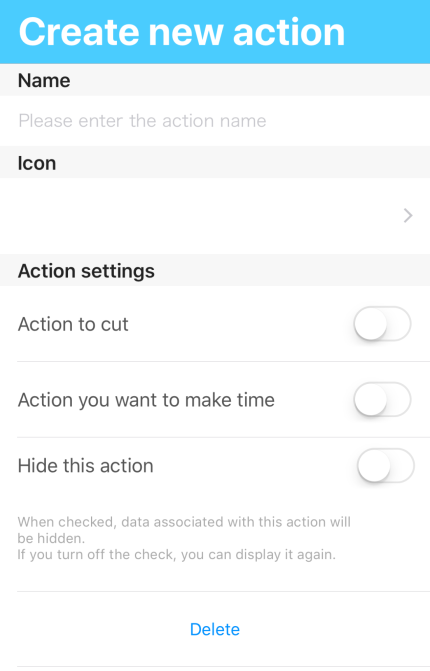 Tap the icon for each action,Start recording actions. The first few actions in the order are displayed for the action. In the TIME HACKER widget, tap the record icon or action icon to start recording. 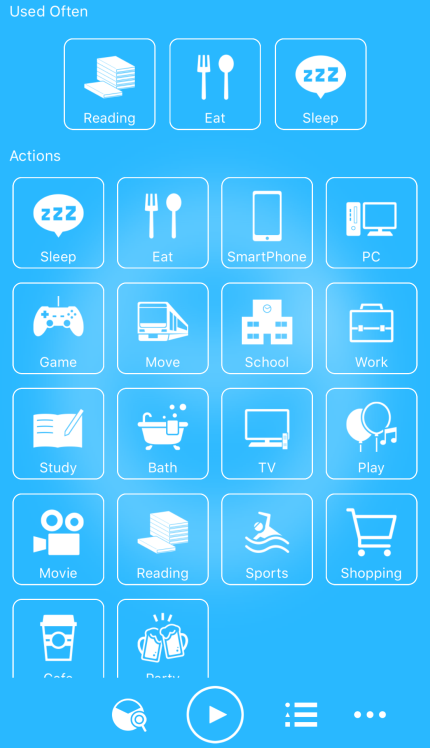 Recording is linked with application and widget. 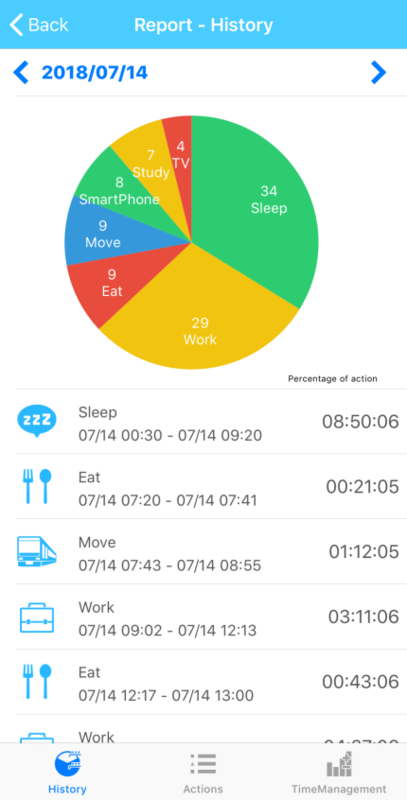 The contents recorded by the widget are also reflected in the application, Conversely, contents recorded by the application are also displayed in the widget. 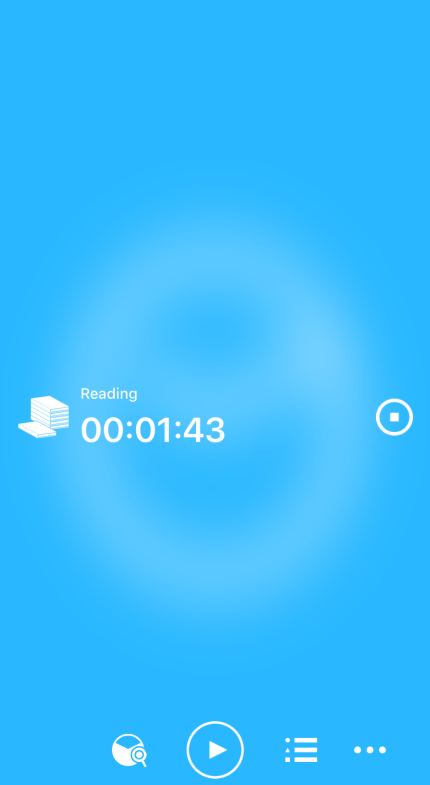 Up to two icons are displayed while recording actions. Third and later are not displayed, but recording is possible.